No, these aren’t what you might wear for pants, and you will be hard-pressed (pardon the pun) to find them in white (though blue is not unusual). The lees (pronounced like the jeans) are the dead yeast cells, grape seeds, pulp, stems, skins, and tartrates that separate from the juice during wine making and aging. When there’s “stuff” at the bottom of the bottle, it’s referred to as sediment or dregs; when you’re discussing the technical aspects of the winemaking, it’s called “the lees” — as in, “this wine was left on the lees for two months, blah blah blah”. Some wines (usually white) are left in contact with their lees to increase the complexity and enhance the structure of the finished wine. By leaving the juice to remain on top of the lees (and/or occasional stirring) after fermentation, all the dead yeast and skins, etc., can provide additional flavors, body, and richness. After a predetermined amount of time “on the lees”, the juice will then be “racked” — a.k.a., moved to a new container (barrel, tank, etc.) — with the lees left behind. An example of a wine left on the lees is Muscadet “Sur Lie”; many white wines in the higher price ranges are also left on the lees — it’s a common tactic for ageable whites and Champagnes. Once in a while, you may see a label announce that the wine is “unfiltered”. This does not mean the winemaker was smoking a Camel cigarette when the wine was bottled, nor does it mean that you need to pour the wine through a coffee filter before drinking it. Basically, it’s an explanation for the wine’s lack of clarity. For the last 25 or so years, wineries have used fining and filtration techniques to make a wine appear crystal-clear. This makes for a more attractive and trustworthy product. Most wines sold at retail today are filtered, and as a result you can see right through them (this is most obvious with white wines). A wine is filtered in one or more more of several ways. For example, sterile filtration uses micropore filters, which are fine enough to remove yeast cells, and thus prevent a second fermentation inside the bottle. On the other hand, depth (or sheet) filtration is not unlike the use of a coffee filter, though is a bit more sophisticated than the typical #4 cone you use in your coffeemaker. The process relies on a thick layer of fine material (diatomaceous earth, cellulose powder, perlite, etc.) to trap and remove small particles. There are other methods as well — membrane filtration is common — and there are pros and cons for each process. Regardless of the way it’s done, the goal is to remove any undesirable elements and produce a stable, clear liquid. 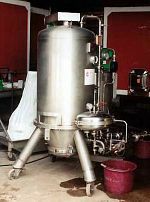 However, these filtering processes may also remove elements that affect the flavors and aromas of a wine, so some winemakers choose not to filter. They believe that filtering strips the wine of its true character, and employ other methods of getting the wine as clear as possible (racking, cold stabilization, and other old-school techniques are the alternative). There are also wineries that avoid filtering — or keep it to an absolute minimum — to maintain organic status. Does an unfiltered wine taste better than a filtered one? Maybe — it all depends on the individual. For many, it can be more of a visual thing than a flavor issue. Some people are put off by a wine that is not completely clear, while others feel a cloudy wine is more “natural”.